Remodeling of any kind can often be a tricky business and quite expensive. 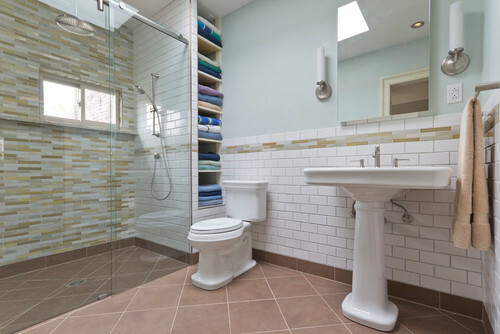 When it comes to bathrooms, whether you’re doing just a few small improvements or redoing the entire space, there are certain things to take care of before you start and others while you’re already in the process. Here are a few common mistakes that people usually make. This is a thing a lot of people disregard when they plan on renovating their bathroom. Most of the time, your sink and shower and/or bathtub will be out of use, and even if they are not the things you are replacing, they will most definitely be covered in fine dust and chunks of dirt so you really won’t be able to use them. If you have an extra bathroom in your house, this doesn’t apply to you, but if not, you should contact your friends or neighbors and see if you could use theirs just for the daily shower and such. This is a very important, time consuming and expensive investment that will last you for many, many years. You don’t really want to mess it up and end up wanting to change the grand design a few months later. Talk with your family, examine different designs, and then decide on a look that suits all of you and plan it all out. Not having a solid plan in the beginning will set you off time-wise and will surely lead to some rash decisions that you might regret later on. You should also coordinate your plan with the budget you are able to spend. This is also a very important step, because you probably won’t be able to exceed your budget if need arises, and going for a cheaper alternative might end up a total failure. Disregarding a good ventilation system in your bathroom can have very bad consequences in the future. If we put aside the odor situation, without a proper fan or ventilation system, humidity coming from showers and washer-driers could lead to mildew forming and paint peeling from your walls, we learn from Inner West Bathroom Renovation professionals. That’s why you shouldn’t forget to install some sort of ventilation system and clean it regularly with a vacuum cleaner. Sometimes our workers can get sloppy, or it can just be a result of miscommunication, but don’t give in to small changes like things being installed in the wrong place or the wrong shade of wall color. This is something you will have to look at for a very long time, and if you’re paying someone to do the job they should do it the way you want to. This being said, if you hire a family member or a close friend to do the job for you, don’t cut them slack just because of your personal relations. You might end up being more aggravated at them in the end. Because this is such a lengthy process you might be tempted to cut a few corners in the very end so as to finish more quickly. That is never a good idea because you are most likely to disregard some key finishing touches which will affect the overall appearance of your bathroom. Keep in mind that you are almost there and stick it out till the end- you will be grateful afterwards.